From the mind of celebrated horror author Stephen King, the man behind such classic terror tales as THE SHINING, CARRIE, and IT, comes one of his most iconic offerings- CHILDREN OF THE CORN. This was a film that prior to this release I'd only seen on VHS. I remember renting this film when I was about 11 or 12 and it was the most brutal film I'd ever seen. The meat slicer scene thoroughly scarred my impressionable young psyche. I buy sliced lunch meat from the deli every Saturday and I always think about this film when I watch the butcher do his thing. Revisiting this film close to 30 years later, I went in with some trepidation. I didn't want to undo the impression this film had left on me. I didn't want to see it as a schlocky B film with dated effects and TV movie of the week acting. Fortunately, CHILDREN OF THE CORN rose to the occasion and stood up surprisingly well. A painstaking 2K restoration from the original negative gives the film a polished look that was missing from the pan and scan VHS of my youth. Anchored by Linda Hamilton's performance as Vicky and Courtney Gains batshit crazy turn as Malachi the film stands out from similar slasher fare of the time. The actors are never winking at the camera to let you know they are in on the joke. This is pre-meta horror and its earnest as hell. I'm not sure if a film like this would be made today and it's a damn shame. Not only does the film have an interesting hook but its executed with absolute seriousness. Granted I could be wrong about all this. I haven't taken the time to dive too deep into the special features as I just got my review copy about 20 hours ago. 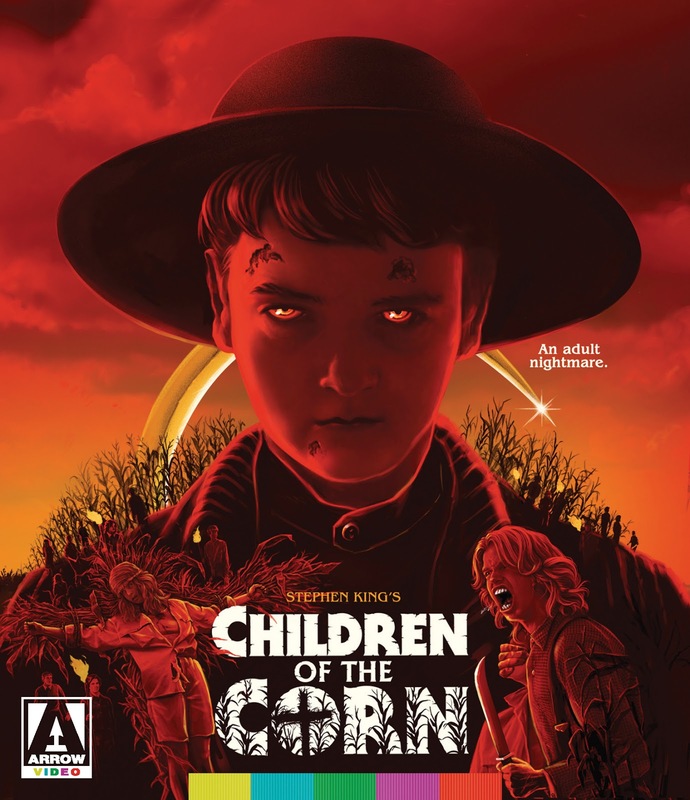 Adapted from King's eponymous short story first published in 1977 and starring Linda Hamilton (THE TERMINATOR), CHILDREN OF THE CORN has gone on to spawn one of the most unlikely horror franchises of all time, I think there are six or seven sequels to this thing. Arrow Video has put together an impressive set of features for this often overlooked genre gem from the 80's. To purchase your copy of CHILDREN OF THE CORN from MVD click here.